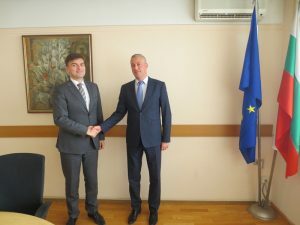 Bulgaria and Slovakia will work to expand bilateral cooperation in the field of investments with high added value, innovation, cyber-security and high-tech sector. This became clear at a meeting with Minister of Economy Bozidar Lukarski and Ambassador of Slovakia Hon. Mr. Marian Yakubotsi on 17.9.2015. “We wish to strengthen bilateral economic relations,” said Ambassador Yakubotsi and added that in this connection, to organize two specific initiatives. These are the forthcoming visit of the President of the Slovak Republic Andrej Kiska in Sofia in November and the meeting of the third session of the Consultative Commission on Economic Cooperation between the Ministry of Economy of the Republic of Bulgaria and the Ministry of Economy of the Slovak Republic, which will be held during his visit. During his visit the President of the Slovak Republic will be accompanied by a business delegation with interest in investing in the area of ​​cyber security, biotechnology and IT sectors. “We see many opportunities for cooperation in these areas,” said Marian Yakubotsi. He also hoped that other areas of mutual interest, including infrastructure and e-governance will be found also. According to the Bulgarian Investment Agency in 2015, among the 100 largest companies with participation of foreign investors in Bulgaria there are none with Slovak participation. Also under the Investment Promotion there are not certified projects with Slovak participation.